VEGETARIAN SAMOSAS THE KING OF SPICY PASTRIES | Authentic Vegetarian Recipes | Traditional Indian Food | Step-by-Step Recipes | Give Me Some Spice! Samosas are available in most places in the world as little triangle pastries filled with a variety of fillings – but only a few places make them the traditional Indian style. They can be made of vegetarian or non-vegetarian fillings. 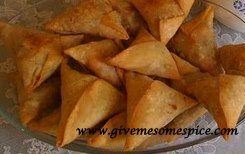 samosas are eaten as a snack with a cup of tea, served as a starter at some meal or served up in a miniature version at posh receptions and serve as canapés. Here’s my recipe for the traditional samosas – the way I was taught by my dad years ago and I follow the same recipe even today. The recipe is easy to make but as with most cooking – preparation is the key to making a good product. Please note: Some of the spices can be adjusted to suit your personal taste. Also you do not add turmeric to samosa filling. 1. Add salt and lemon to the plain flour. Add some warm water to the flour to make a dough. (My photograph will give you an idea of how firm to make the dough). Cover and rest the dough. 2. Dice the potatoes, peppers and carrots. Add the peas and soya beans to the mixture. Wash the vegetables and leave them in a colander. Dice the onion finely, chop the green chilies and coriander finely but do not add them to the vegetables. 3. Warm the sunflower oil in a saucepan, add the cumin seeds. Once they start to go golden brown, add the vegetables to the oil. Add in the ginger, salt, chilly powder and sugar. Let this mixture cook gently. Try not to add any water to the mixture. Wash your vegetables just before you add them to the hot oil so that there is enough moisture to enable the vegetables to cook. You can cook the vegetables in the microwave if you are worried that the vegetables may get burnt. When using the microwave, cook them for 5 minutes, stir and cook again for 5 minutes. Repeat this until the vegetables are cooked al dente. 4. Add the lemon juice and cook them for a further 5 minutes. 5. Remove the mixture from the heat and add the onions, green chilies and coriander to the mixture. By adding these items uncooked at the end will give the samosas a nice flavour to the mixture. When you eat the samosas, you’ll be able to taste all the spices as well as the onions and chilies. 6. Allow the mixture to start cooling down. 2. Take two balls of the dough balls roll both of them in a circle to around 3 inch diameter. 3. Lightly oil one side of the rolled out pastry. 4. Sprinkle some plain flour to the second rolled out pastry. This will resemble a chapati. 6. In the meantime – warm the griddle or dry flying pan on a warm setting. 7. 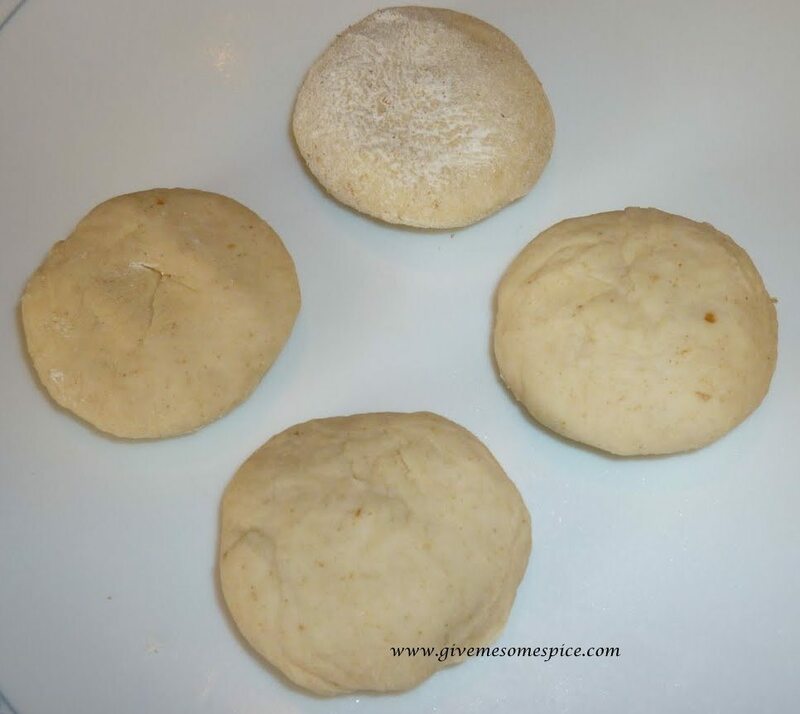 Sprinkle some flour to this pastry and roll out the pastry in a circle. 8. Cook the chapati on the griddle for half a minute and turn to the second side. ( My photographs below will illustrate this). By lightly cooking the chapati, it removes any air bubbles that might be in the pastry. 9. Remove the pastry on a work top and separate the two chapatis. 10. Cut the rotis into two and finish making the rest of the chapatis. 11. Keep all the chapatis covered using a clean tea towel. Now the chapatis are ready to be filled with the samosa mixture. Once you get the hang of making the chapatis, you can always prepare them and freeze them for when you wish to use them. Just remember to defrost them correctly. However, we need to make some “paste” to seal the samosas. 1. Take 2 or 3 tablespoons of plain white flour and add warm water to the flour. Stir the mixture and the consistency should resemble glue. 1. Take half a chapati. 2. Using a teaspoon, add some paste on half the semi circle side. 3. Fold it as shown in my pictures below. 5. Allow the samosas to rest for half an hour. If you have managed to make extra, you can freeze them at this stage. 7. Gently fry the samosas in hot sunflower oil until crispy and very light golden brown. 8. Serve with sweet chilly sauce or coriander and chilly chutney. Or as I mentioned before, just enjoy them with your favourite dip or a cup of tea. The reason, I call Samosas the king of all pastries is because it does require a lot of preparations but once you have made them, you will never buy ready made frozen and preserved samosas ever. They are the best and made to your personal taste. What fillings do you like in your samosas? Punjabi Samosas – To fry or not to fry?